Sadako Sasaki was only two years old when the atomic bomb was dropped on Hiroshima on August 6, 1945. Approximately 140,000 people died as a result of that blast, but Sadako survived and grew to become a strong athletic girl. When she was eleven, practicing for a big running race at school, she became dizzy and fell to the ground. She was hospitalized, and diagnosed with leukemia, the “atom bomb disease”. Lying in bed one day, Sadako heard a knock at the door. Chizuko, a friend from school had come to visit with a small gift – a gold paper crane. Intrigued, Sadako asked, “What is this?” Her friend told her of an old Japanese legend, which said that anyone who folded a thousand origami cranes would be granted a wish. Sadako wanted to go home, to run again, so she made her wish. Despite the crippling pain, she persevered, folding cranes out of medicine bottle wrappers and any other paper she could find. Though each day found her weaker and weaker, she managed to fold over a thousand cranes. But she never went home. She died at the young age of twelve. 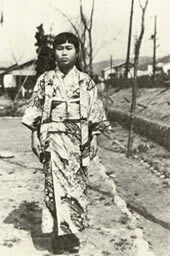 Touched deeply by Sadako's courage, her friends and schoolmates rallied to raise funds for a memorial to honour her and all the children who died from the effects of the atomic bomb. Students from more than three thousand schools in Japan and across the world contributed to the building of a nine-metre high statue of Sadako holding a golden crane. The statue's inscription reads: “This is our cry, This is our prayer, Peace in the world.” Today, people all over the world fold origami cranes and send them to this monument at the Hiroshima Peace Park.